Nook: Shall I Compare Thee to a Summer's Day? Warning: picture swiped from unsuspecting blog. I'm currently reading the unexpurgated From Here to Eternity, not whatever happens to be showing on this Nook's screen. The (frankly to me) stale arguments about the Kindle/Nook/Kobo readers versus the iPad/Galaxy Tab/whatever usually center on the user experience reading outside: the passive E Ink screen on Kindle/Nook/Kobo is easy to read in bright sunlight while the iPad and its android imitators use the same LCD displays that smartphones use -- and we all know what it's like trying to do anything useful on a smartphone in bright sunlight. But since it happens to be Summer and I'm doing more than a little Nook 3G reading out of doors these days I've discovered an advantage and a disadvantage of using an ereader of any stripe while sitting on the porch or by the pool. Advantage: On the other hand, while reading on the porch the other day and enjoying a breeze while sipping a drink I realized I didn't have to hold my Nook firmly in my hands or worry about the wind blowing the pages and losing my place. I could put the device on a table, read away, and from time to time bring refreshment to my lips without thinking twice about what a sudden gust might do to my place or my equanimity. Fringe benefit: no need to risk creasing the spine of a book you love in a vain attempt to windproof it by getting it to lie flat, lowering its profile, and minimizing sudden-breeze page drag. Since these observations are, as nerds like to say, device agnostic (i.e., they apply universally to the ereading experience regardless of the device you're using), they're not likely to change anyone's mind about whether to go active or passive in choosing a display. 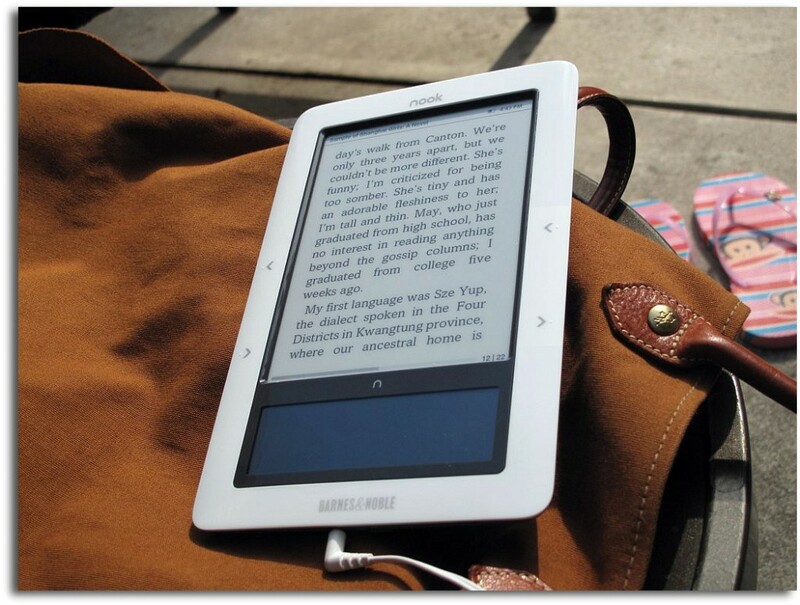 To me the E Ink/LCD decision remains largely monetary -- though I read somwhere recently that iPad buyers tend to be male and dedicated ereader buyers tend to be female. Regardless of gender, is there any doubt iPad owners are likely affluent, while dedicated ereader owners, at least since prices have fallen toward the $100 mark, likely aren't? 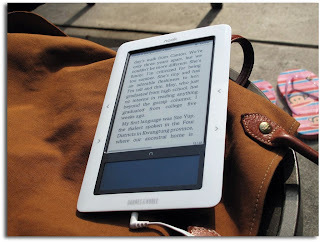 No matter: I'm interested in knowing what you ereader users out there have found are the Summertime advantages and disadvantages to your device, regardless of whether it's a Nook, Kindle, Kobo Reader, iPad, Galaxy Tab -- you get the idea. Please comment and let me know. Thank you.